olive Table olives are one of the most delicious and healthy snacks around –especially when hailing from Greece. 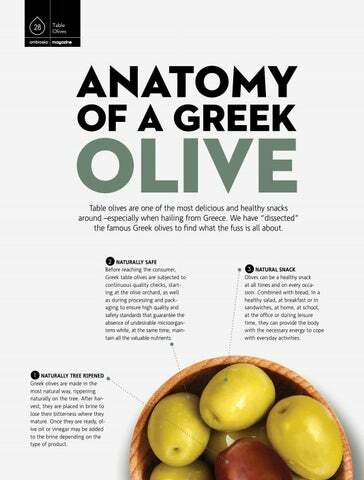 We have “dissected” the famous Greek olives to find what the fuss is all about. NATURALLY SAFE Before reaching the consumer, Greek table olives are subjected to continuous quality checks, starting at the olive orchard, as well as during processing and packaging to ensure high quality and safety standards that guarantee the absence of undesirable microorganisms while, at the same time, maintain all the valuable nutrients. 1 NATURALLY TREE RIPENED Greek olives are made in the most natural way, rippening naturally on the tree. After harvest, they are placed in brine to lose their bitterness where they mature. Once they are ready, olive oil or vinegar may be added to the brine depending on the type of product. 3 NATURAL SNACK Olives can be a healthy snack at all times and on every occasion. Combined with bread, in a healthy salad, at breakfast or in sandwiches, at home, at school, at the office or during leisure time, they can provide the body with the necessary energy to cope with everyday activities.